But the formula doesn't last nearly as long on, as Lustre. You need to touch up more. There's transfer, where there isn't much with Lustre. And so forth. A lipstick's formula is key, actually, easily as important as its color. 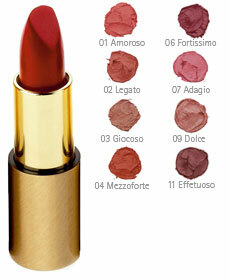 Dr. Hauschka lipstick! I've actually swatched some of these (Elephant Pharmacy in Berkeley carries them). #01 and #07, Amoroso and Adagio, respectively, looked fabulous on me. #09, Dolce, was kinda blah...not bad, but not enough color. #03, Giocoso, was too brown on me. It's quite brown. Amoroso is a lovely reddish shade, I'd say it's a bit warm. Adagio is definitely pink, again a bit on the warm side (I can't wear cool lipstick shades, they look harsh on me). But I haven't really tried them out, as in wearing them day by day, so I don't know how good the formula is. I didn't detect any perfume or flavor in them...I prefer the faint vanilla of MAC or the candied rose of Chanel, but hey, no scent/taste is better than scent/taste you don't like.